Did you know that there is a medieval village – one of Italy’s most beautiful villages – in the hinterland of Lake Maggiore, just a short drive away? It’s the town of Vogogna, previously the capital of Ossola Inferiore and home to a 14th-century Castello Visconteo (Visconti castle), and up higher, the rocca (fort). Do you love little ancient villages full of history? Do you love getting lost in the pedestrian alleys from past times? Are you fascinated by surprises that are revealed around the corner? Then it's worth travelling a few kilometres to tour Vogogna! 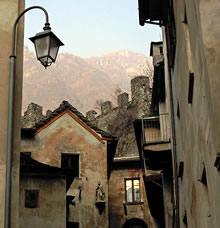 This pleasant village is in the northern part of Piedmont, between Lake Maggiore, Lake Mergozzo and nearby Switzerland. It’s a truly green area surrounded by the majestic mountains in the Val Grande National Park and also the Sempione Pass, Mount Rosa, and the Centovalli area with the panoramic Domodossola-Locarno railway. Certainly the first thing to see in Vogogna is the old town centre, which is considered one of Italy’s most beautiful medieval villages. It’s home to cobblestone alleys, houses with characteristic gneiss stone roofs and blooming balconies in the summer. One of the most important historic buildings is the Gothic Palazzo Pretorio (built in 1348) and its porticoes. There is also the majestic Parish Church of Sacro Cuore di Gesù;, whose Neo-Gothic style is quite unique. There are also votive frescoes from the 15th and 16th centuries. The ruins of the rocca are in the higher part of Vogogna; its origins appear to date back to the 5th century. It is known for certain that it was of strategic importance to defend the area. Giovanni Visconti decided to renovate it in the 14th century as he wanted a true stronghold. Visiting Vogogna also means visiting the Castello Visconteo (Visconti castle) and its unique semi-circular tower. It was built by Giovanni Visconti in the 14th century as a defence bastion due to its dominating position with respect to the rest of the village. It was a prison in the second half of the 19th century. Today it is an event centre for the Ossola Valley. Children are amused every year on Christmas Eve when the streets in the old town centre come alive with a living crèche, a charming re-enactment of the nativity scene under the ancient porticos and inside the castle, in historic costumes and representing scenes from daily life in ancient Palestine, including Baby Jesus’ hut. A sacred performance is organised every two years (even years) at Easter – it’s just as good as the more famous ones. Today, Compagnia del Capitan Bergamino (an evolution of the previous troupe Compagnia d’Arme Ducale) provides an example of Vogogna’s history with weapons and costumes used in the 15th century. This troupe rooted in the village re-enacts history through medieval vestiges used in the dukedom of Milan. Group members put on sword fights (la storta e la daga) for the public. These techniques were learned by researching manuals from the period. They also re-enact battles at the events they participate in. Compagnia del Capitan Bergamino is a member of the Consorzio Europeo di Ricostruzione Storica (European Consortium of Historic Re-enactments) and participates in historic events in Italy and abroad. Visitors in Vogogna can also go horseback riding (referred to as equiturismo) in the Bosco Tenso WWF Nature Oasis. It’s not far from the starting point of the charming panoramic itinerary Lago Maggiore Express and visitors can stay in a 4-star hotel with spa.